Last month, after years of dreaming about it, I had the opportunity to dive the reef and come face to face with some of the most beautiful underwater landscapes I’ve ever seen. The experience has a way of spontaneously filling memory cards. 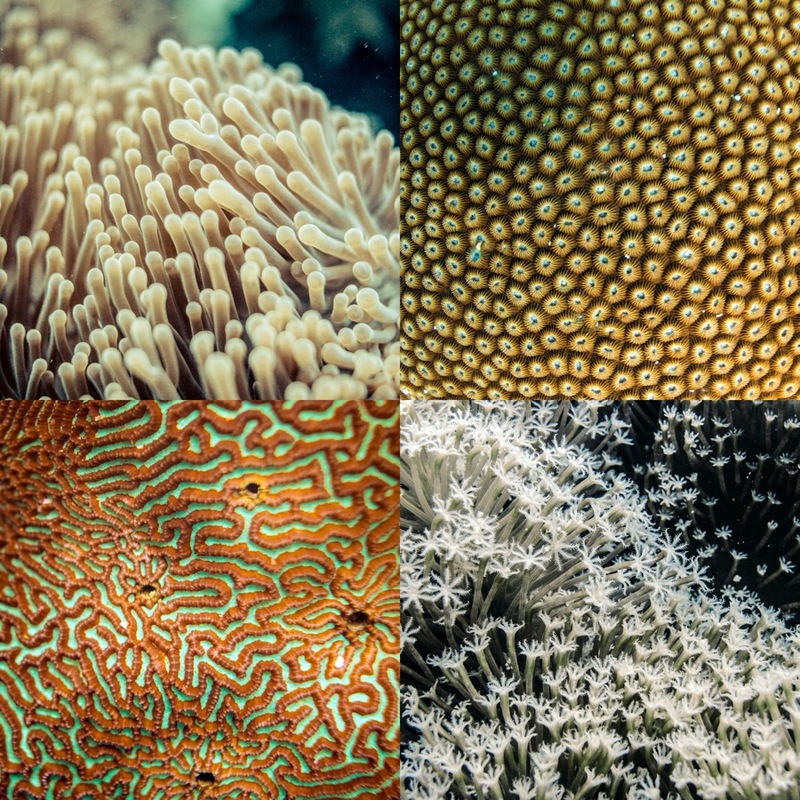 In that spirit, here are 44 images I took during my time on the Great Barrier Reef, off the coast of Queensland, Australia. 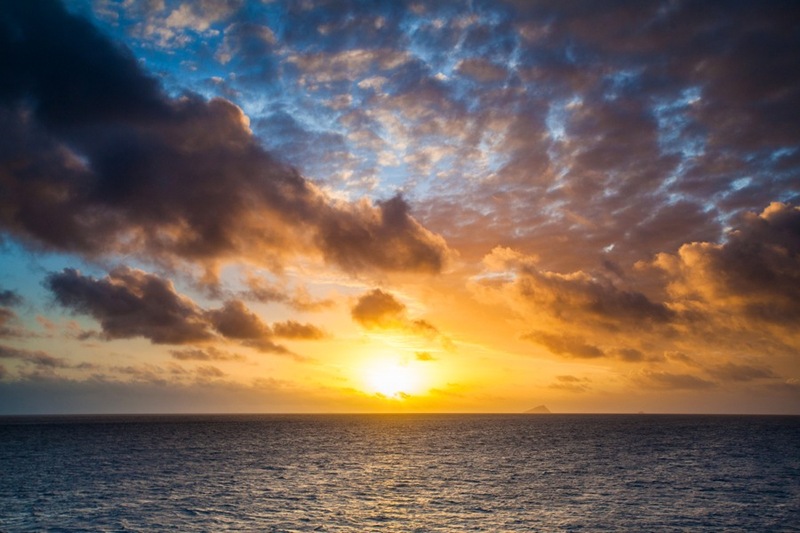 1,600 miles long, 133,000 square miles in area, comprising 3,000+ individual reefs and islands, and home to thousands of species. 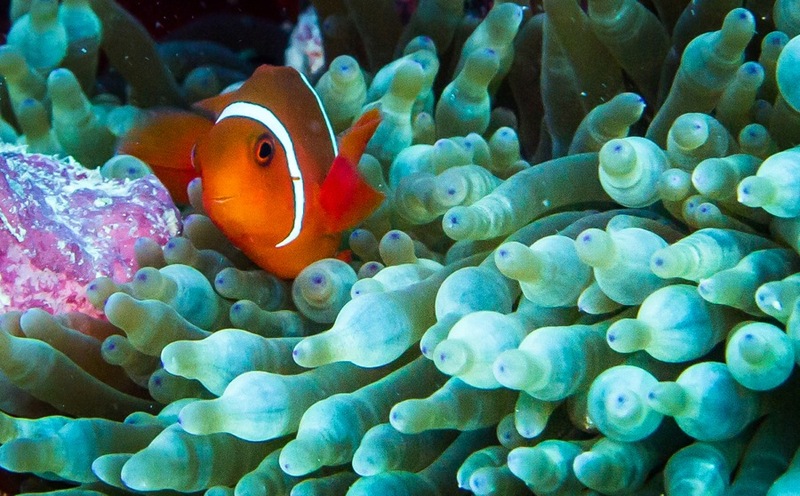 Finding Nemo is one of the first things you want to do when you dive the Great Barrier Reef. 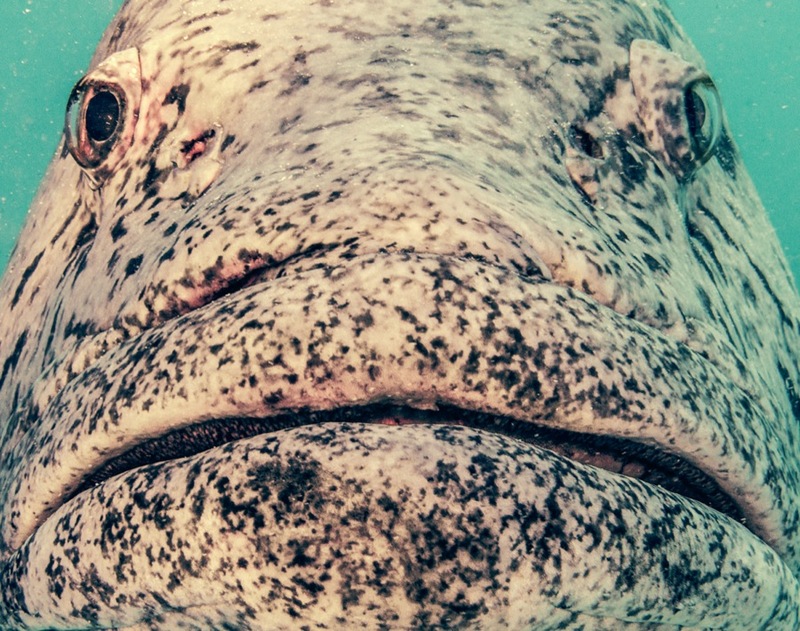 Around the world, these poor fish have probably been extremely confused as to why, for the past 10 years, everyone has been getting in their face for a photo. 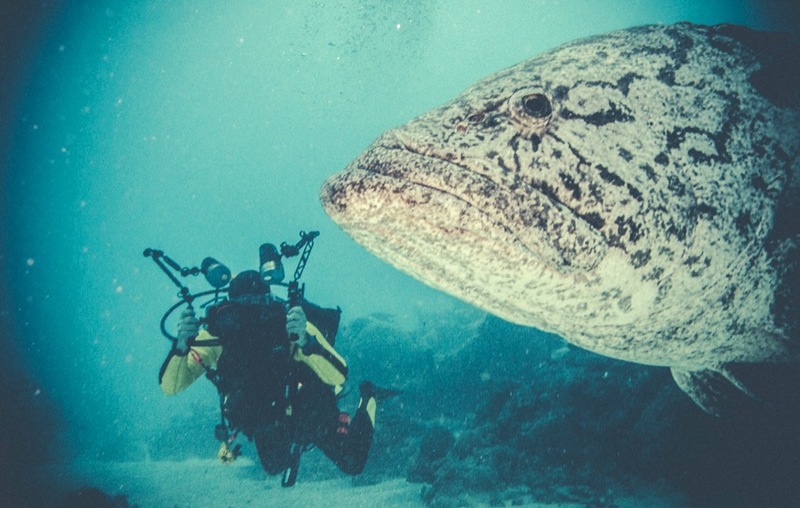 The Cod Hole is a special dive site that gives access to the giant potato cod. 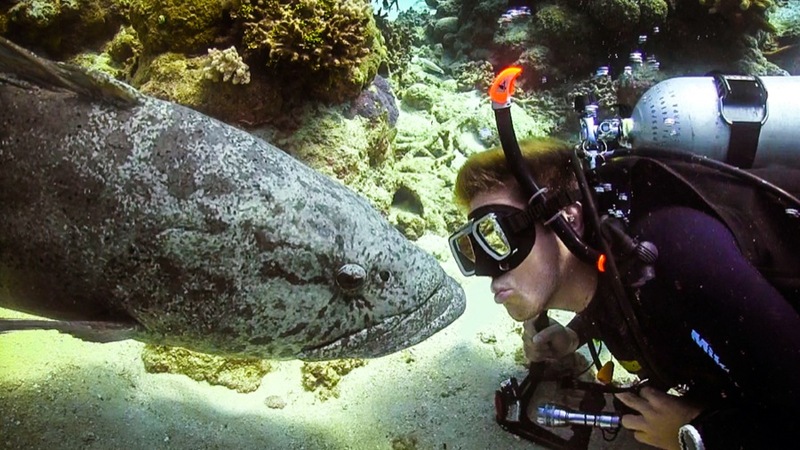 This friendly fish likes to get extremely close to divers, and oftentimes you can see them looking at their reflection in your goggles. Did I mention these guys get really close? They can grow up to 110kg and over 8.5 feet long. 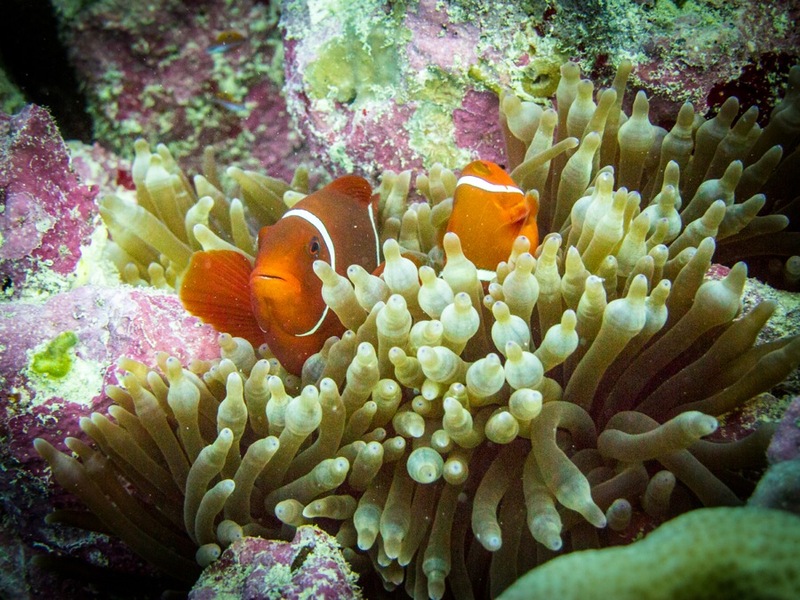 Some of the beautiful underwater life of the GBR, including sharks and an absolute abundance of tropical fish. 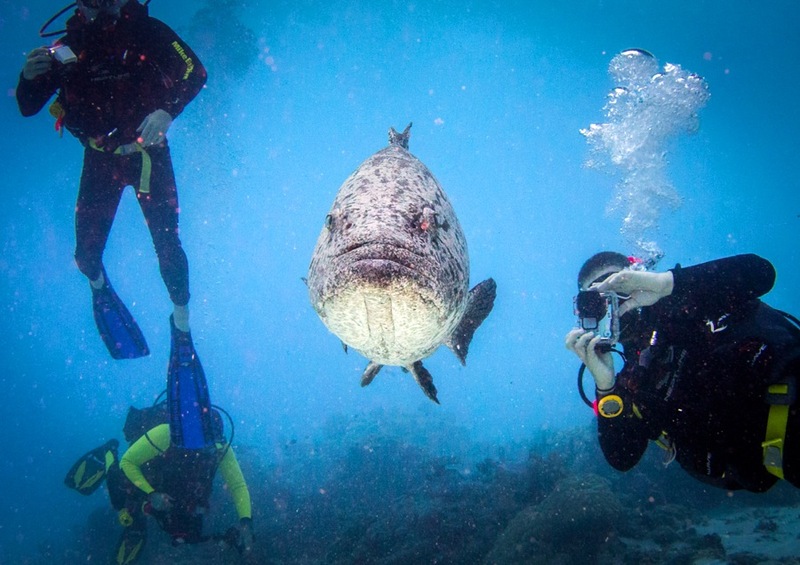 The GBR is a photographer's dream, and those who come don't mess around with the gear they bring. 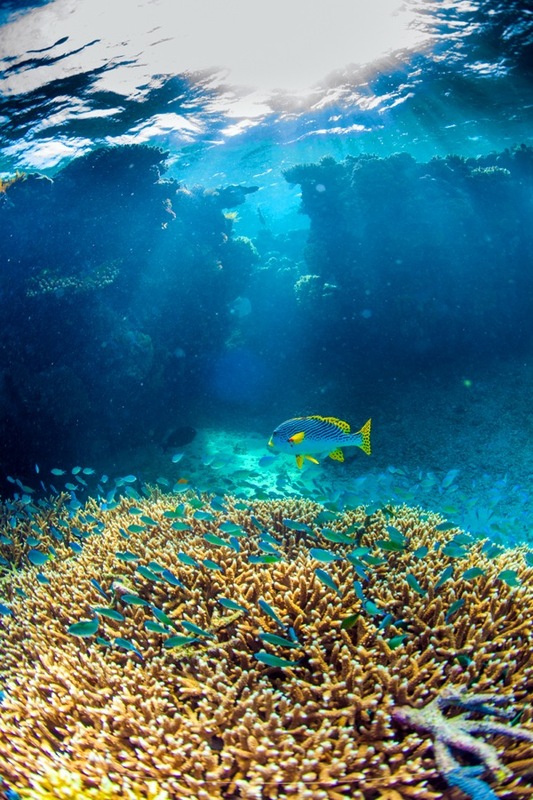 This coral spire shoots up to within a few feet of the ocean's surface and is covered with fish. A shot of the reef from above. 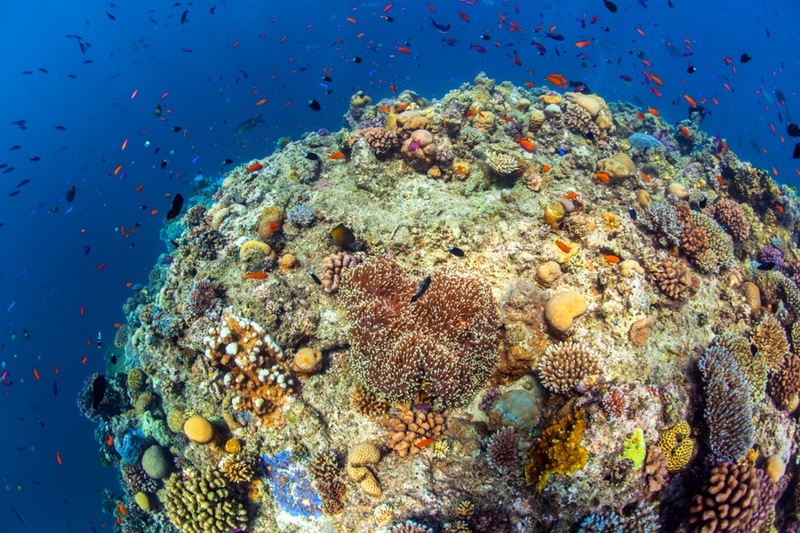 Apart from a scattering of islands, most of the reef comes to within just a few feet of the water's surface, as seen here. 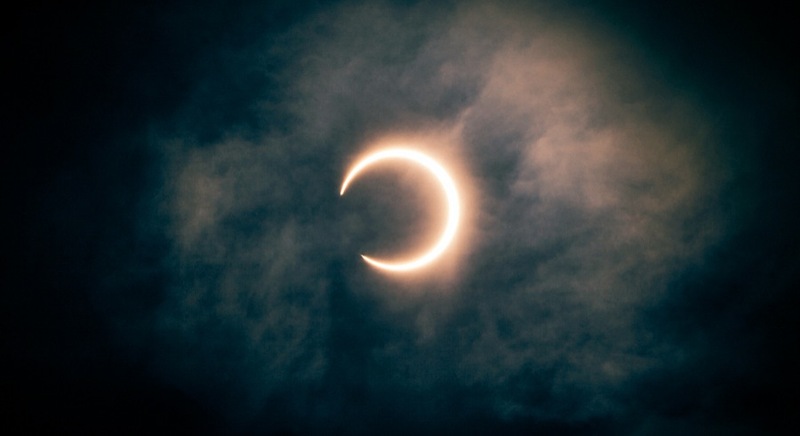 On my second day on the dive boat, there was an annular solar eclipse. The rest of the passengers and I sat outside and handed around eclipse glasses to watch. 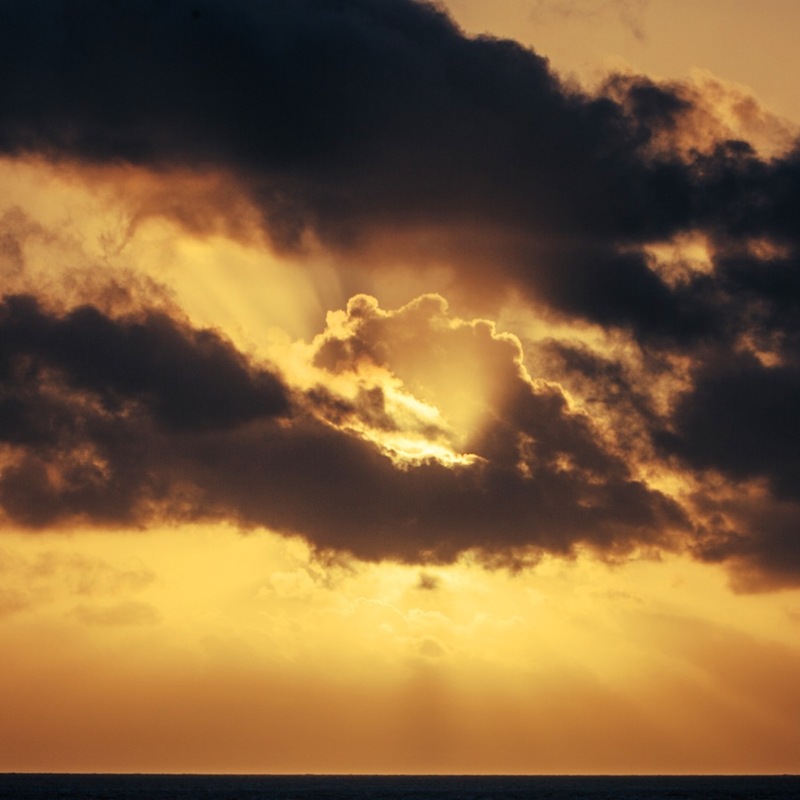 I snapped away and was lucky enough to capture an image just as a cloud passed by and the moon and sun once again exposed themselves to us. 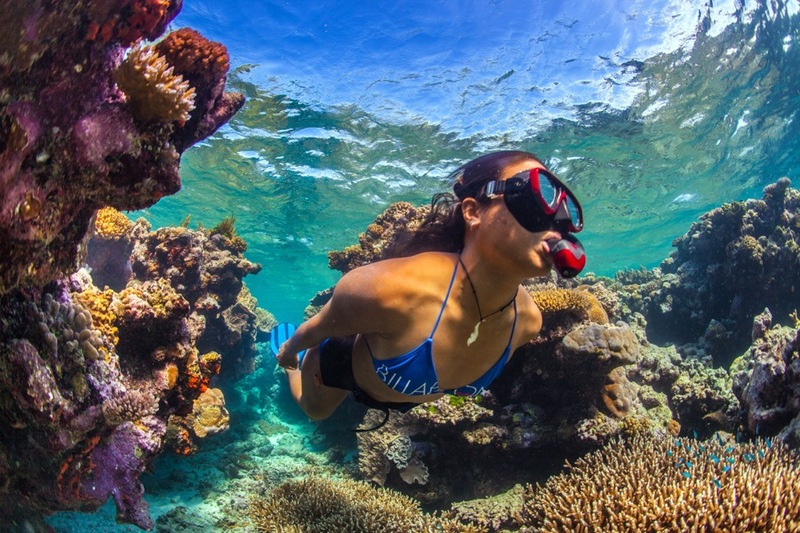 The Spoilsport, the exclusive dive boat of Mike Ball Dive Expeditions, isn't a bad place to spend a week on the GBR. 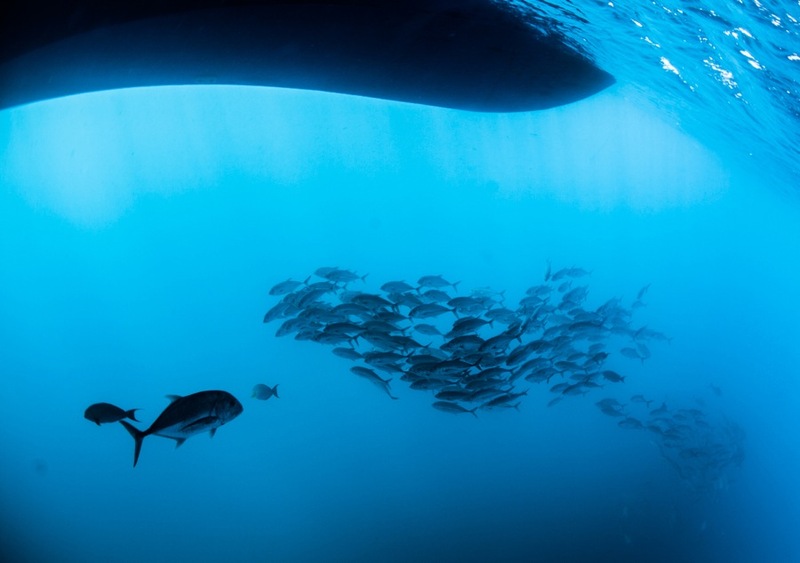 A school of big-eye jack fish beneath the Spoilsport. Down we go, to another adventure at the bottom of the sea. 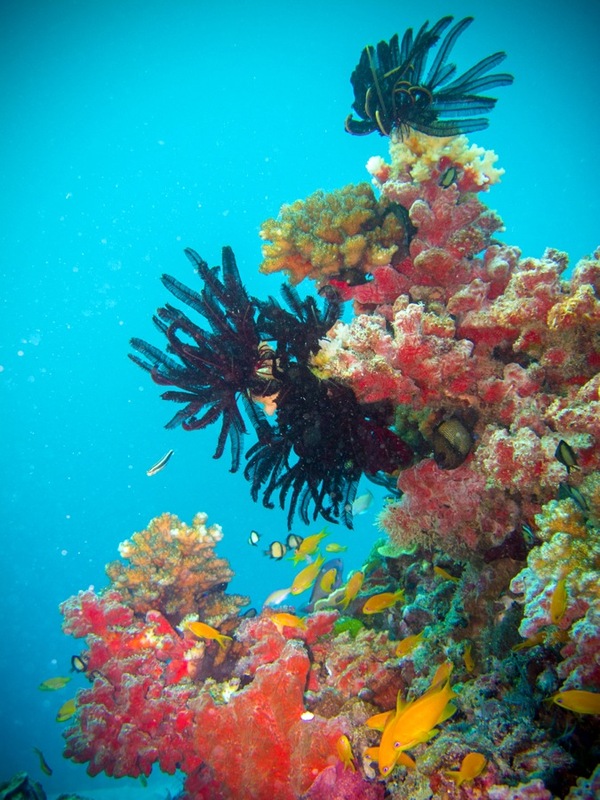 There seemed to be no limit to the number of colors and size variations of the coral of the GBR. 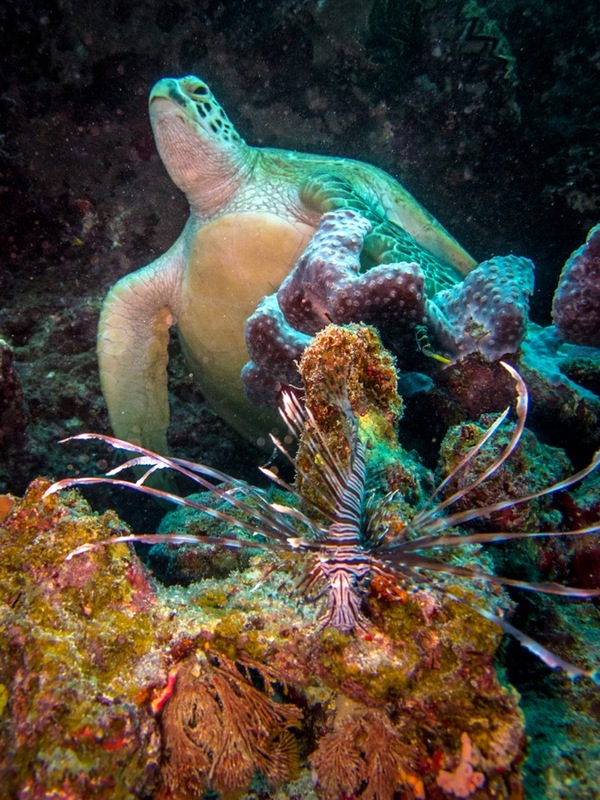 A lionfish scans for food while a giant turtle perches on top of a coral shelf above…another typical dive. 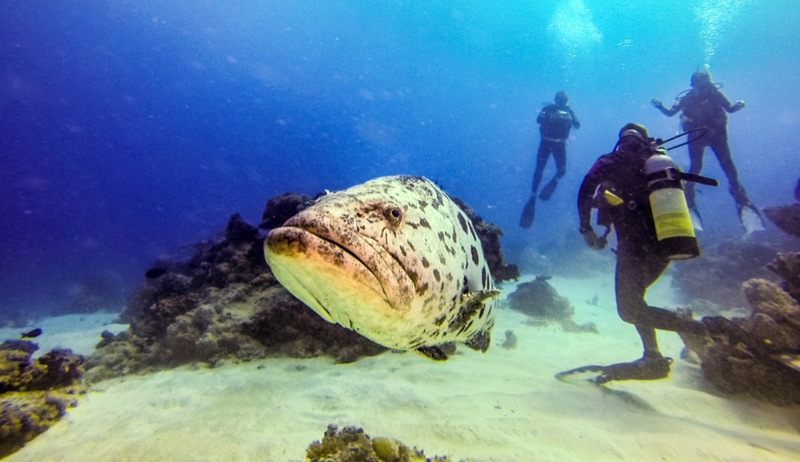 Another encounter with the massive potato cod. Here's a shot of me trying to go all the way -- I did my best to get a kiss but she wasn't having any of it. 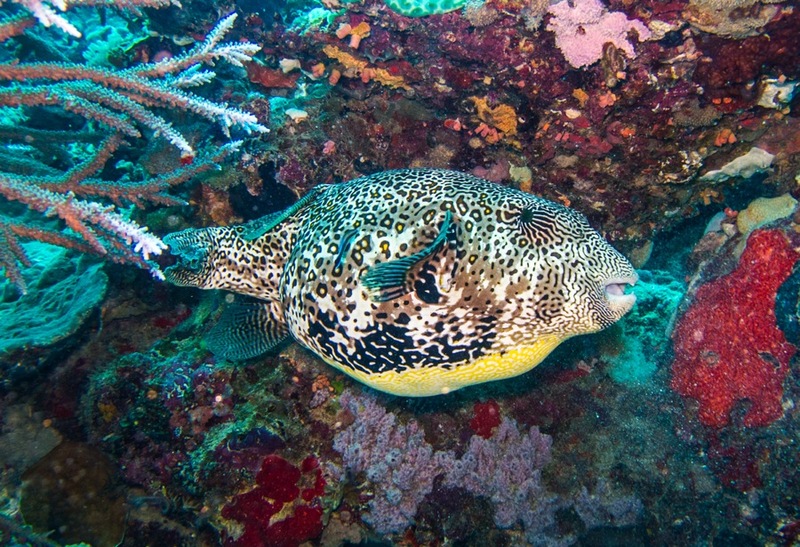 A species of triggerfish making its way around the reef. 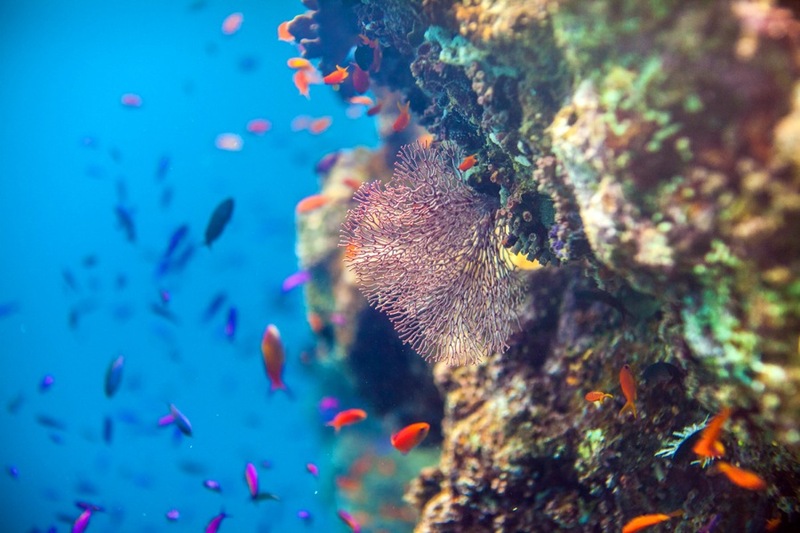 The bold colors of the reef. 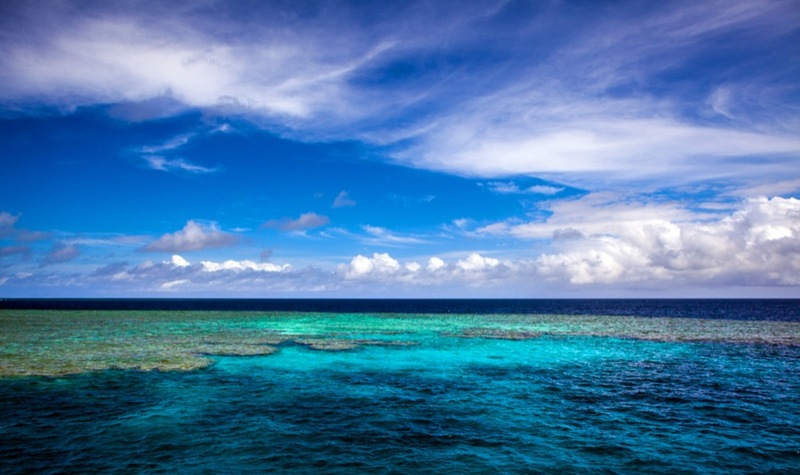 Another view of the Great Barrier Reef from above the waterline. 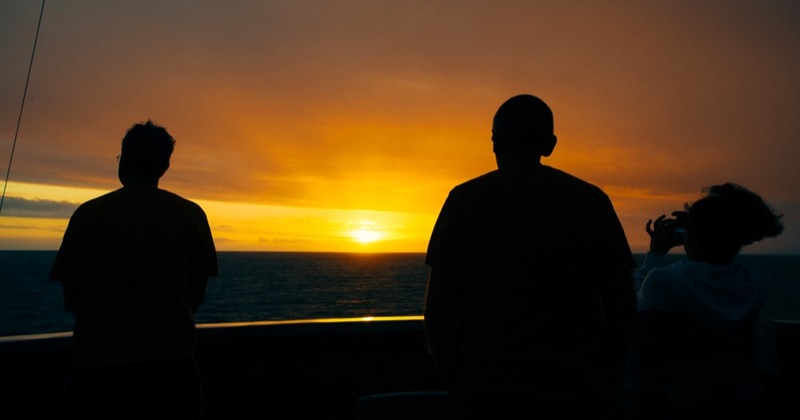 Divers take a minute to relax after another beautiful day of diving. 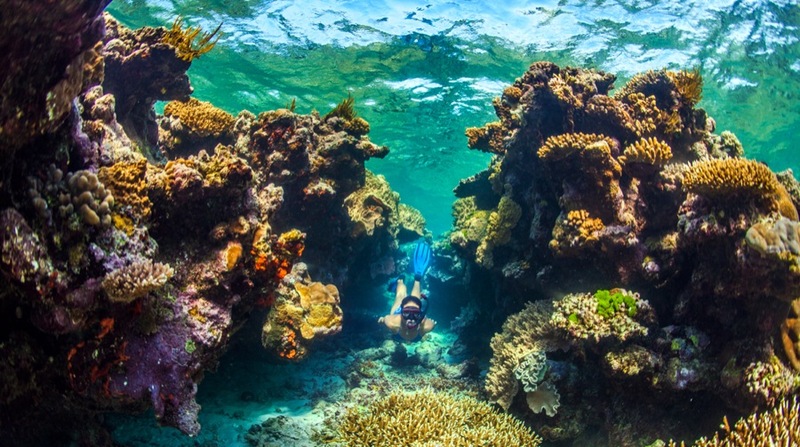 Life on the Spoilsport consists of: nibbling on kangaroo, listening to Captain Trevor serenade us, and closing it all out with the daily homemade dessert…you can get used to life out on the reef. Anyone for a night swim? 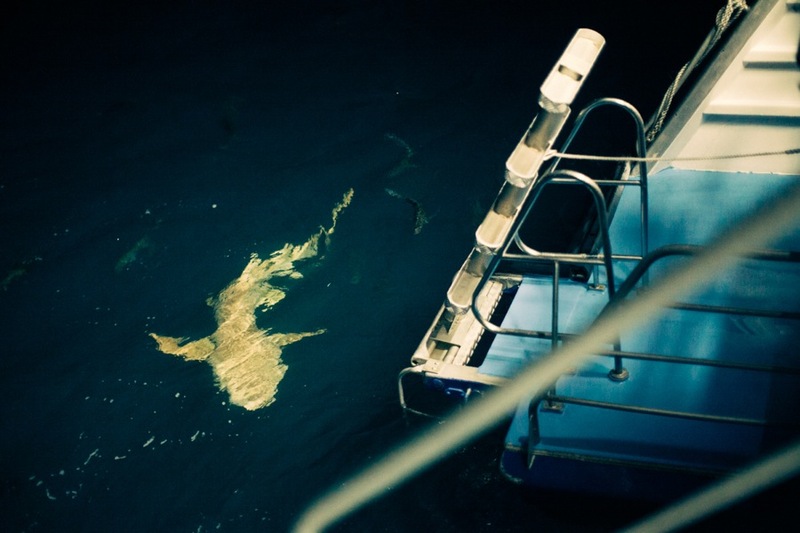 At night, sharks gathered at the back of the boat, making the evening dip ever so alluring. 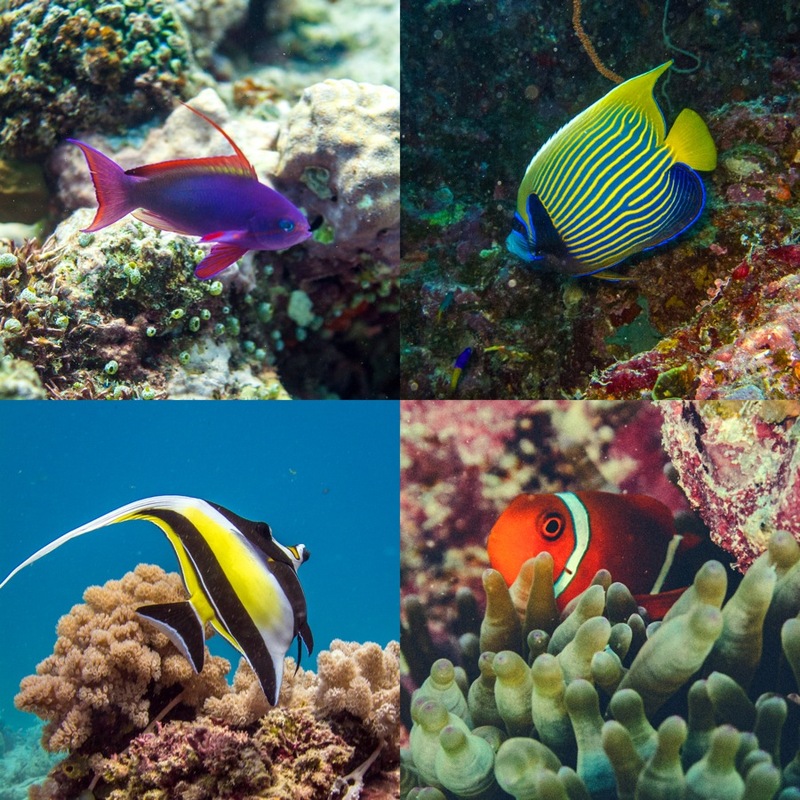 The colors of the fish on the reef are insane; everywhere you look there's another fluorescent specimen swimming by. 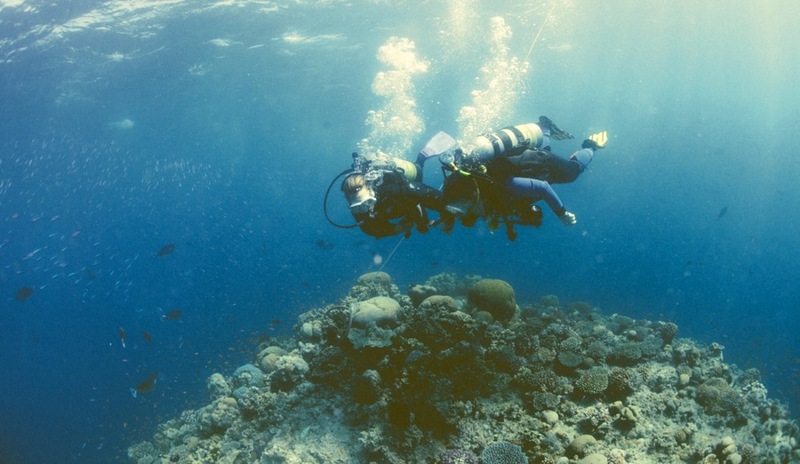 I'm sorry, did I mention the Great Barrier Reef has a few good spots to go for a swim? Can't recall if I did or not? 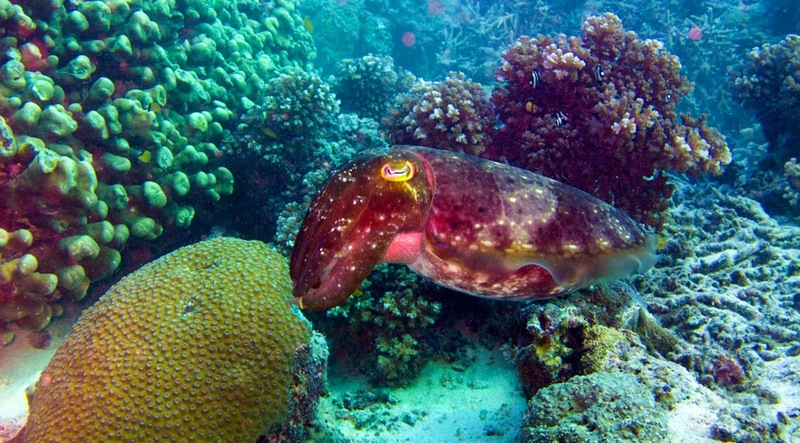 I watched this cuttlefish change colors repeatedly right in front of me. Its spots would turn dark and then glow like they were lit from behind. 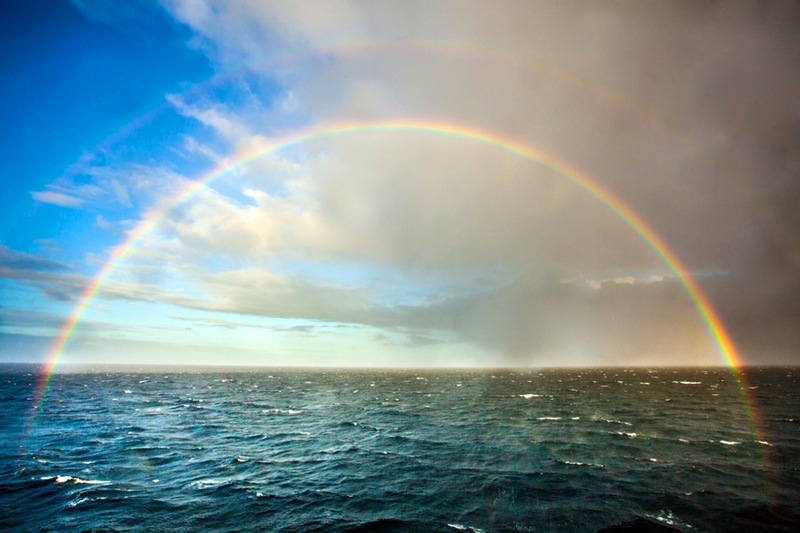 One afternoon, while on the top deck of the boat, I turned to see a complete rainbow in front of me. 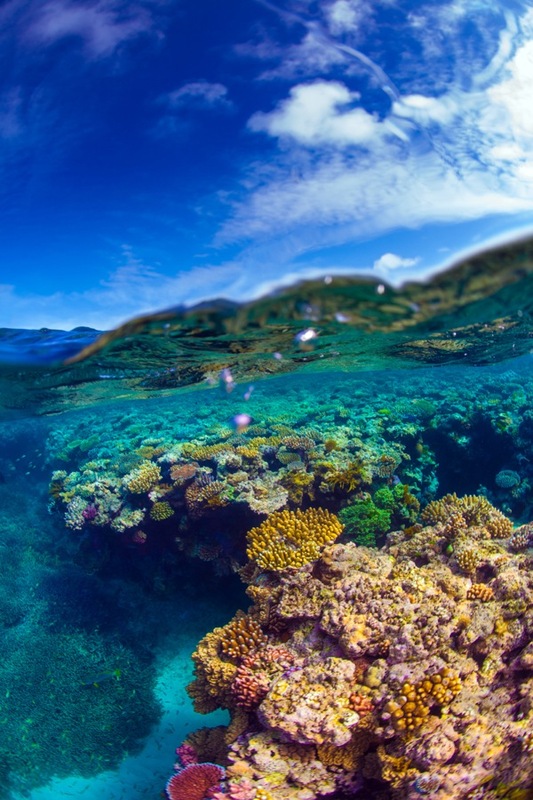 Lizard island is one of the few islands on the Great Barrier Reef that has any infrastructure. With a luxury resort and some beautiful beaches, it wasn't a bad place to stop for the day. Just imagine this scene replaying itself every day. 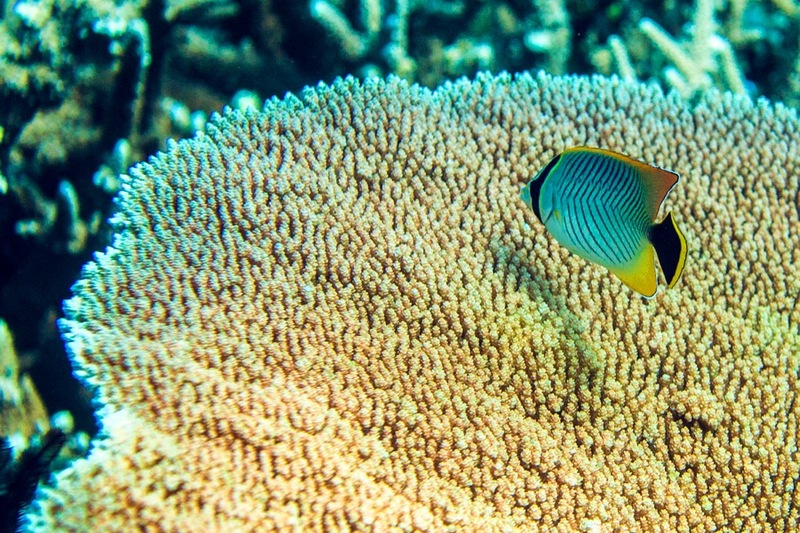 A butterfly fish swims around some coral. 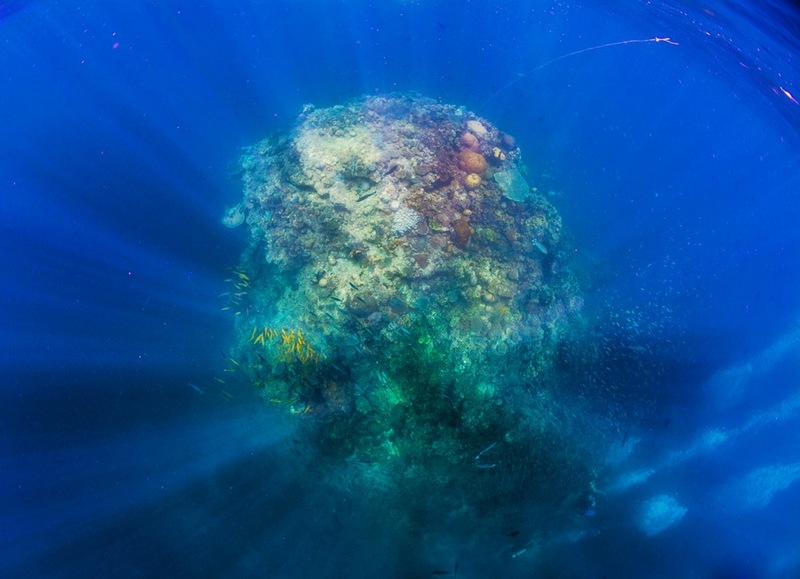 I really like this image, where you can see the sun's rays shooting towards the bottom of the sea while they're met by the bubbles of the divers already below. This guy was the ultimate chiller. 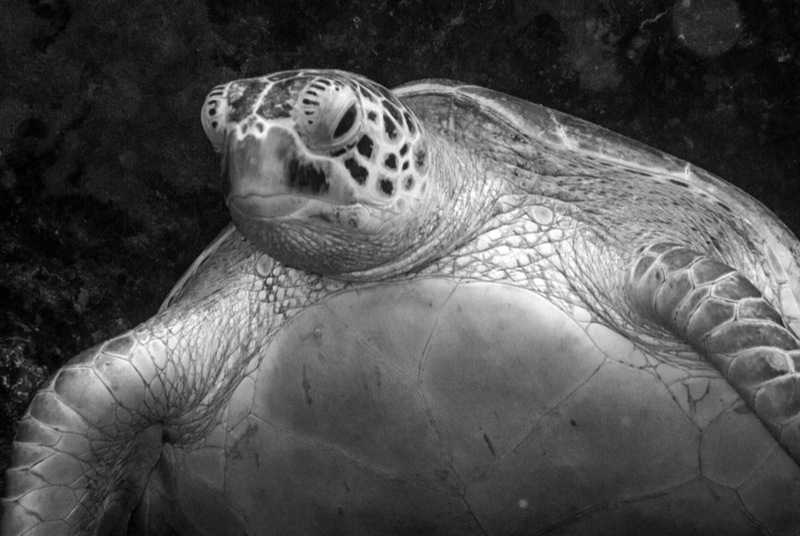 He's the same turtle from the image with the lionfish (#15). I spent a few minutes trying to take some shots of him, and he had this look like, "Enough with the photos already, trying to sleep here, aright?" 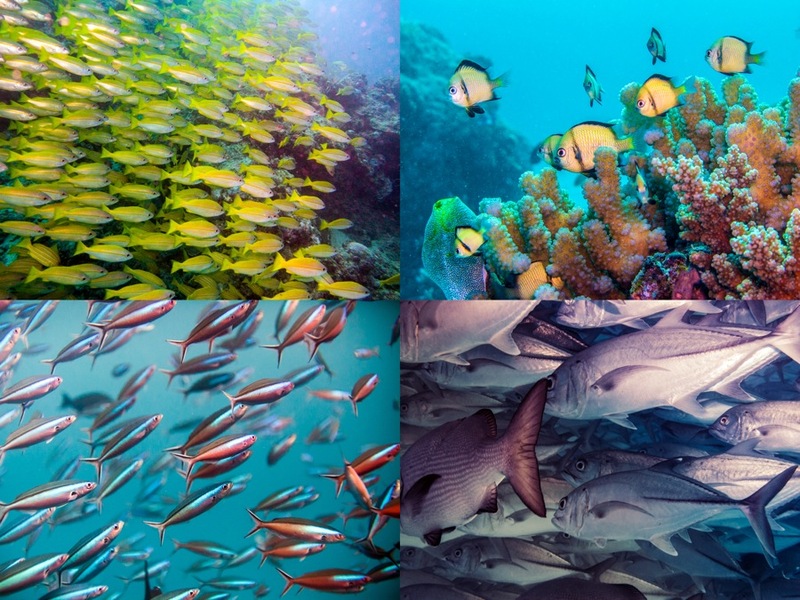 Various types of fish move about in their schools. 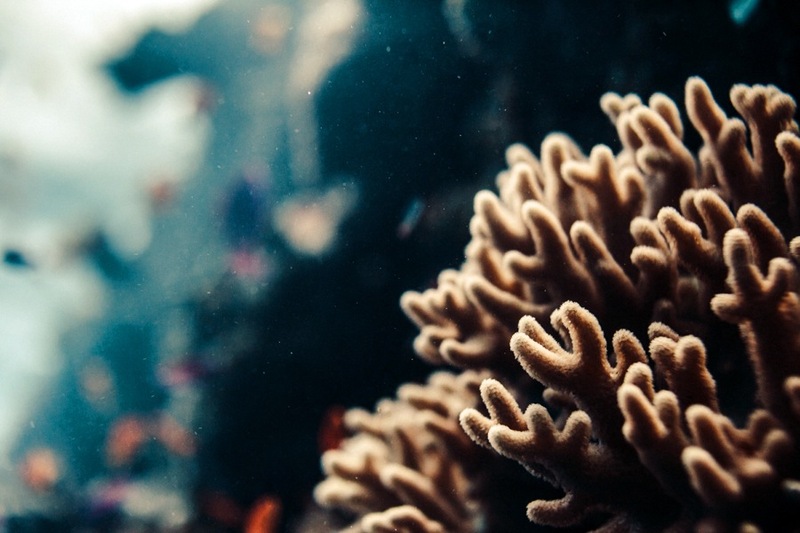 So much love gets thrown on the fish, when in actuality it's the coral and the reef that make all this marine life possible. Another evening on the GBR. 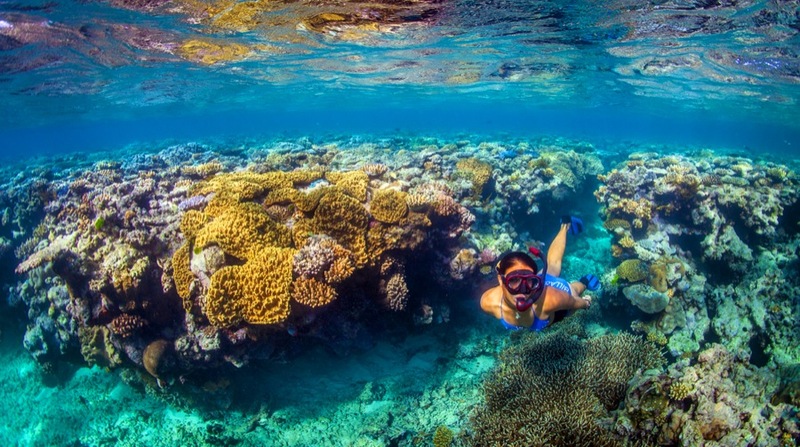 Last but not least…the Great Barrier Reef is a pretty damn good place to go for a little swim.